In my last post, I outlined three important skills I learned as a PM at Manifold. If you haven’t read it please check that out first. 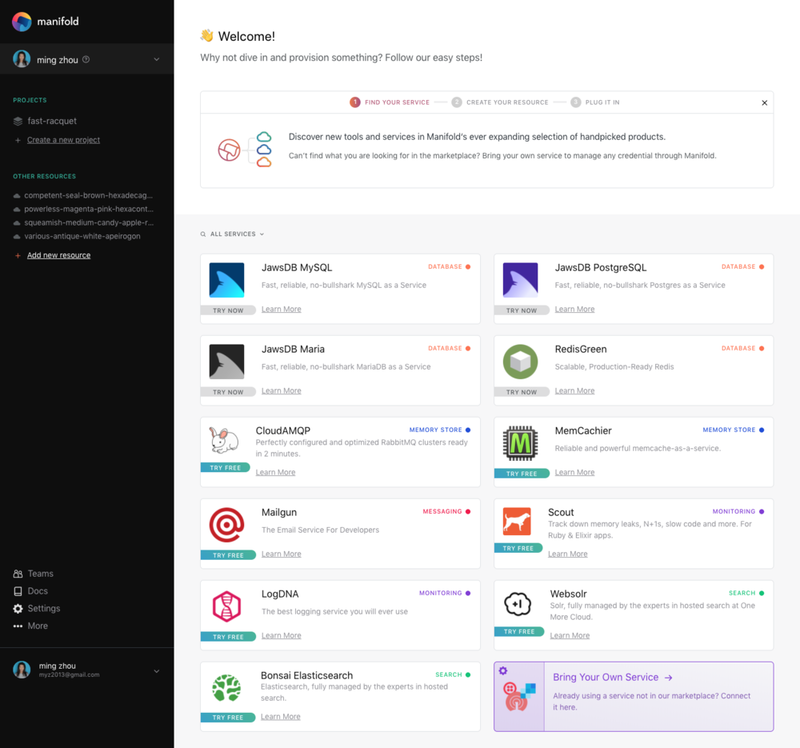 Manifold’s dashboard has evolved a lot since its beta launch. In this post, I’m going to walk through how making ‘good’ decisions, ruthless prioritization, and accomplishing everything through others has helped me PM the product to where it is today. 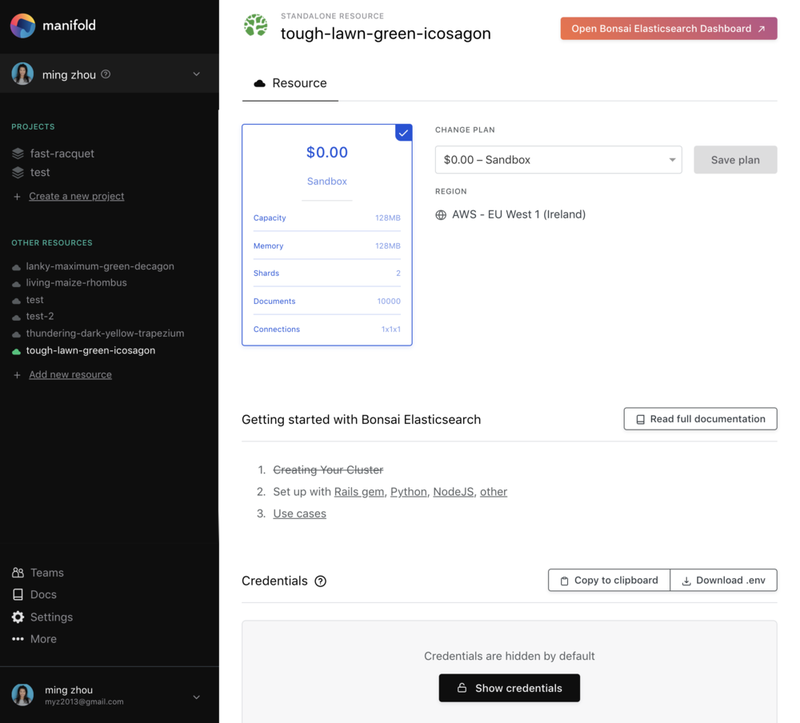 When Manifold launched in Beta, we had one service on the marketplace (shout out to John at JawsDB). There wasn’t much functionality and there didn’t need to be. Users signed in to Manifold and purchased one product. Very straightforward. Once Manifold launched in GA, things became more complicated. We added more features, an additional ten services, and everyone had a different opinion on what the dashboard should be. 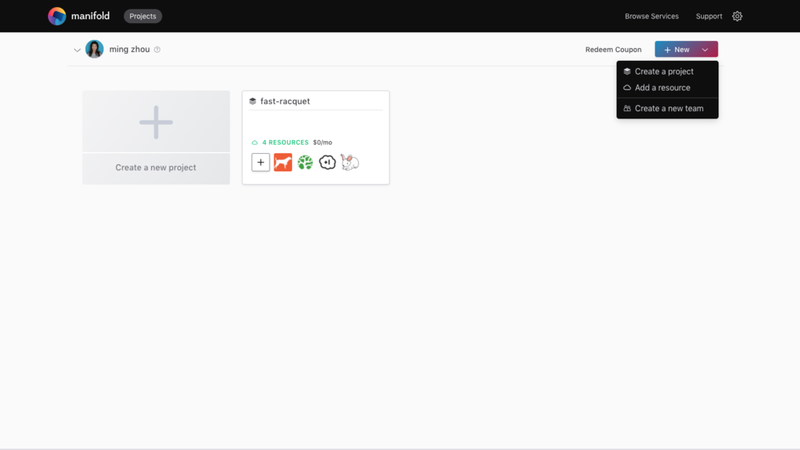 As we added more services and more features, the dashboard continued to become more complicated. It was around this time that I joined Manifold (see V1). You can see below that there is clearly more functionality that didn’t exist before. When users land on the dashboard for the first time, they can either create projects, teams, or resources, all with questionable and unknown value. In fact, creating a project was the most prominent action a user was driven to, yet if you’ve ever used Manifold, you’d know creating a project doesn’t show off the magic of our product. Easily buying services, easily modifying plans, and SSOing directly into third party dashboards are where we really shine! There was no intention with our dashboard and lacked on-boarding, it was a mix of features. There were many ways we could have improved the dashboard, but with a small team and limited resources I had to practice ruthless prioritization. It might surprise you that ruthless prioritization doesn’t mean ‘focus on building out one feature and forget everything else’, although that can be an example of ruthless prioritization. The ruthless prioritization in V2 was to focus on a single part of the overall funnel and make that portion of the funnel better for our users. It’s tempting to look at the entire funnel and say, “Let’s improve all parts of it!”, but more often than not that results in a lack of discernible progress across the board, as resources and focus would be spread thin. For this iteration, I ruthlessly prioritized on-boarding. Providing a great on-boarding experience was the focus for this quarter because our funnel was leaky and we determined the most impactful way to improve the product was through the new user experience. You can see later how that prioritization transforms the dashboard. With a single focus, I was able to leverage our team to improve the product on-boarding experience. Nick Tassone, our Head of Design, redesigned the dashboard to have a universal sidebar, Colin White implemented Appcues to test different ways to onboard new users, Sitara Ramesh gave us data each step of the way, and Margaret improved our nurture campaigns. The Manifold dashboard previously lacked focus and intent, but with the singular focus of on-boarding, we were able to turn things around. What do you want new users to do when they first land on your product? You definitely don’t want to drive users to an action that produces no immediate value for them. People’s patience and attention are limited, you need them to get to the core action (aha moment) ASAP. Every action the user takes during on-boarding is crucial and needs to provide immediate value. It was my job as the PM to figure out what the aha moment was for our users and the immediate value our product should provide. With a singular focus, our team was able to asynchronously create a good on-boarding experience, while I focused on answering these questions. How do you know what the aha moment is for your users? How do you decide what immediate value to provide when your product has so many cool features? The answer comes back to making ‘good’ decisions and taking a holistic approach. Making iterative changes and quick decisions will guide you towards finding your product aha moment. Before overhauling our entire product to create an on-boarding experience, we utilized Appcues to learn the ways we could influence users. Appcues became an interim on-boarding solution before building out our own solution and I learned a ton from it. For example, we were able to drive 95% of new users to provision LogDNA because that’s where the Appcues on-boarding took them. I leveraged User Testing to test high fidelity Invision prototypes of new on-boarding flows before spending any engineering hours. I tested and iterated the on-boarding design three times over before it ever got to the engineering team. Implementing Appcues as an iterative change gave me the room I needed to validate my assumptions before building. In addition to User Testing, I did a ton of customer interviews. How did I decide what the aha moment was for our users? I asked them. According to customer interviews, users really got the magic of our product once they’d gone through one provision flow and were able to SSO directly into a third party dashboard. The insights from customer interviews drove the decisions I made in the product on-boarding flow. The combination of customer interviews and User Testing made making ‘good’ decisions that much easier. These questions drove my decision to create a next steps section as the last part of on-boarding to help get our users started with the service they just bought. Manifold links to documentation in many different places of the flow but as a user you don’t want to read through pages and pages of documentation just to get started. Having a quick overview of the steps to get started with links to specific libraries you should download is really helpful for developers who don’t need all the extra context. A few short steps also illustrates what value Manifold provides for the user. As you can see above, we even purposefully crossed out step one to show users that we’ve done step 1 of 3 for them. Using the tools I had on hand and by leveraging each team member’s expertise, I was able to make informed decisions and increase the probability of making a ‘good’ decision. What to do when you don’t have enough data? Sometimes you don’t have enough data to get a meaningful signal. This was something I struggled with early on before our public launch, when we had a small sample size. It was hard to gauge what our customers were thinking when the data was not significant. My advice is to trust your gut. As PMs you have more context than anyone else on the team. You’re the one driving iterative changes, making many of the product decisions, testing and interviewing customers, and looking at the quantitative and qualitative data. The combination of all these separate pieces of information informs your decision making even if you think you’re going off intuition. The most important lesson I learned while PMing the Manifold dashboard is that it’s not about being right, it’s about finding the right solution that accomplishes the goal. With the tools available, a great team to lean on, and practicing “strong opinions loosely held”, you will eventually end up with the right solution. It might not be this iteration, or the next, that you reach your goal. But as long as you’re always progressing in the right direction you will eventually get there. Our dashboard isn’t perfect and there’s still a lot of room for improvement. Even with this process your product won’t be perfect overnight, but being a good PM is embracing imperfection while keeping your eye on the goal. Learn from your mistakes and leverage the team to continue making progress.